The nine point personality system used as a basis for all training is called the Enneagram (pronounced ‘any-a-gram’). This human development model describes nine distinct personality profiles, each of which has a distinctive pattern of thought, feeling and action. It goes to the heart of all interactive issues in work situations. 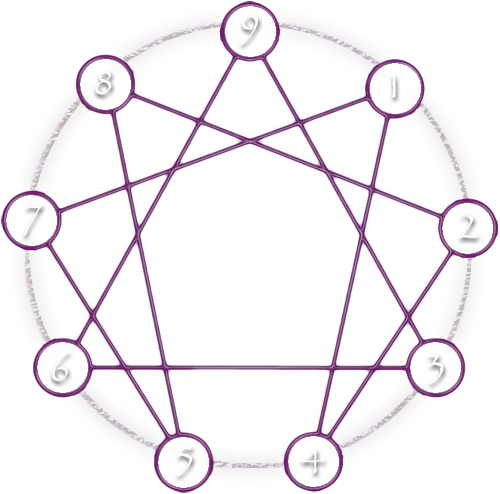 The nine personality profiles are arranged on an Enneagram as illustrated on the left. This unusual nine-pointed star-like diagram has been known for hundreds of years since the time of Pythagoras, the Greek philosopher c.500 BC. The lines between each point on the diagram show key relationships between the profiles. Each of the profiles illustrates patterns that have a specific viewpoint or belief structure that largely determines what is important to them. This effects how they communicate and interact with others. It also gives an indication as to what they find stressful, how they handle conflict and their style of leadership. The Enneagram also points out three equally important centres of intelligence: the mind, heart and body each of which has a role to play when making decisions or communicating with others. Discovering your profile is the starting point for all the trainings. This allows you to discover the unconscious motivations that determine much of your behaviour. Understanding your Enneagram personality type can literally change your life – not only in your work environment but in the way you cope with your relationships and life circumstances.